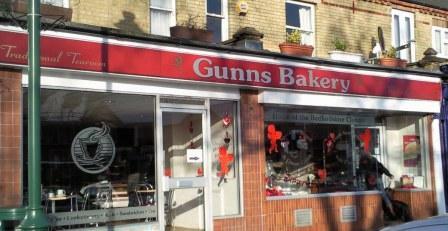 Welcome to Gunns Bakery - Home of the Bedfordshire Clanger! JAMIE & JIMMY IN "CLANGER" COUNTRY! 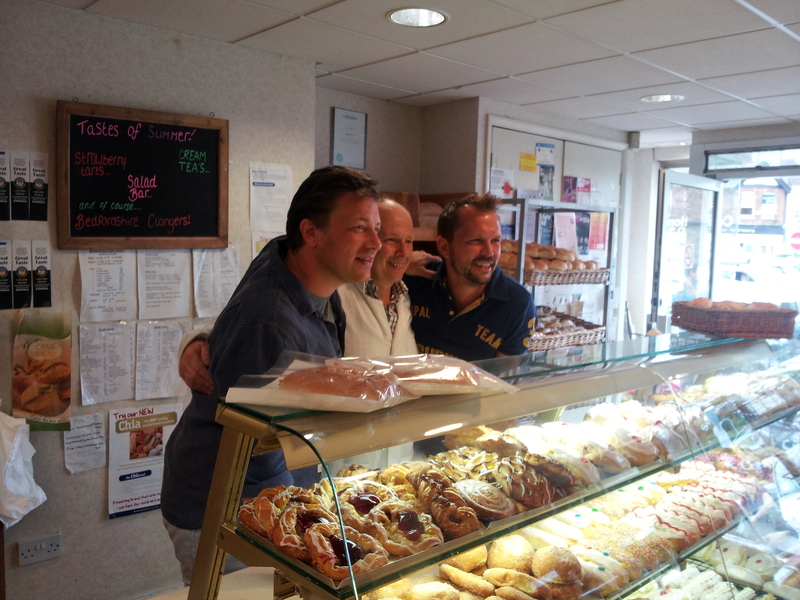 One hot Wednesday last July, the TV celebrity chef Jamie Oliver and his buddy Jimmy Doherty pulled up at our stall at Biggleswade's Farmers' Market and started selling Bedfordshire Clangers. Within a short time a large crowd formed and Jamie promised to spend a day or two helping to revitalise the Clanger and bring it to the attention of our younger customers. As good as his word Jamie and Jimmy proceeded to develop three tasty new fillings for our Clangers. With the help of Anne Franklin supplying her farm kitchen for recipe experimentation and after a long afternoon's work, they invited us along to taste-test the new varieties. Sitting in the farm garden in eager anticipation we cut up and tried, straight from the aga, three wonderful new fillings specially designed to keep the Bedfordshire Clanger popular for the next hundred years! To continue the story and to discover the new varieties, click to see our Bedfordshire Clanger page. You can also mail order your delicious Clangers! Gunns Bakery has been providing it's local customers with traditional home made breads, cakes and pastries since 1928 and is proud to be the home of the best pastry of them all...the Bedfordshire Clanger! Hand made and using the finest ingredients insures our loyal customers come back every time. Whether you're shopping for your family, planning a special occasion or just on the go with a snack Gunns Bakery produces vibrant and mouth watering products to suit all your catering needs. Please check out our products page, bursting with samples we have to offer. Over 80 years have passed since this family bakery settled into premises on the old Great North Road in Sandy. Much has changed from those days of selling from the bake house and from horse-drawn carts to modern vans delivering to our own shops and a host of other varied outlets around the county.